YAPE, the self-driving last-mile delivery system made entirely in Italy has won the German Design Award 2019, one of the world’s most prestigious accolades in the industrial design sector. The vehicle, created and developed by Yape Srl, part of the e-Novia group – the Enterprise Factory – came first in the Utility Vehicle category, beating logistical and industrial products from all over the world. 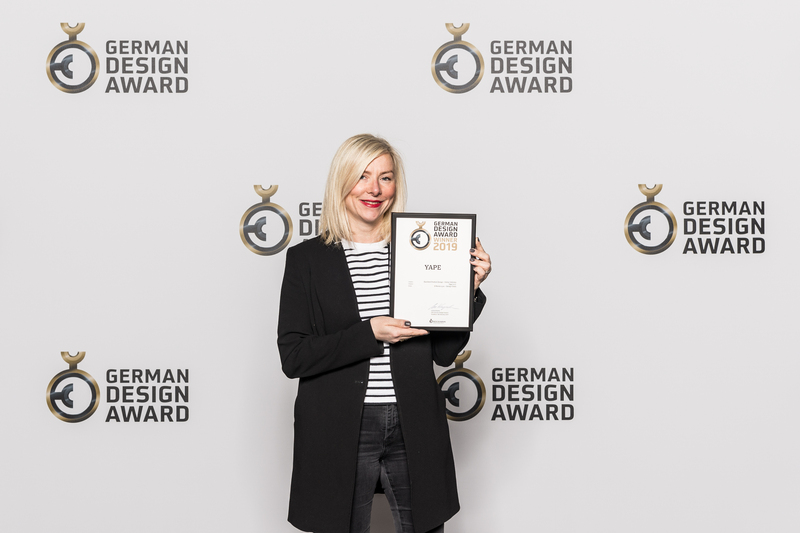 The award has been handed over to Margherita Colleoni, Chief Design Officer at E-Novia (Photo: Lutz Sternstein), during a gala evening in Frankfurt on the last 8th of February. “YAPE, with its rounded design which is so friendly and appealing, is the perfect solution for the last mile” explained the judges of the award, who added that YAPE is: “an extraordinary alternative to the delivery of goods via drone”. The success of this self-driving delivery system is helping to draw attention to the potential of the Italian hi-tech sector. “This important accolade awarded to YAPE is testament yet again to how our country can excel thanks to its distinctive skills, including in the field of technology” commented Vincenzo Russi, CEO of e-Novia, who continued: “This entrepreneurial project combines engineering excellence, refined cognitive algorithms and modern industrial design, in a strategic sector like urban mobility. Less than two years into the YAPE project, this latest achievement by e-Novia shows the Italian capacity to create companies and products which are able to grow rapidly on the market and compete on the same level as the biggest international players”.